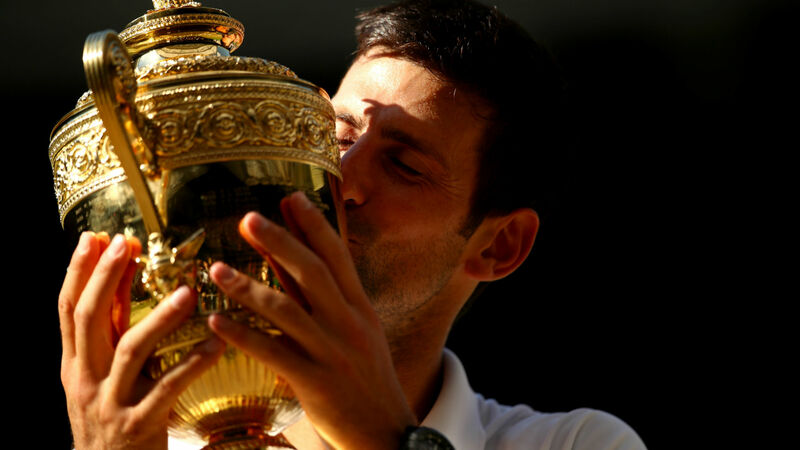 An ecstatic Novak Djokovic said there was “no better place in the world to make a comeback” after claiming his first grand slam title in just over two years with a straight-sets victory over Kevin Anderson in the Wimbledon men’s singles final. Djokovic was the ATP Tour’s dominant figure when he won the French Open in June 2016, ensuring he held all four slam crowns simultaneously. However, the Serbian then endured a surprising decline as injuries and a loss of form saw him tumble down the rankings. The world number 21 at the start of the tournament, Djokovic looked back to his best at Wimbledon, edging out Rafael Nadal in a thrilling last-four tie before beating Anderson 6-2 6-2 7-6 (7-3) in Sunday’s final on Center Court to secure a 13th slam success. Novak Djokovic joins Reggie Doherty, Rod Laver and Anthony Wilding in a tie for sixth-most #Wimbledons all-time with . After receiving his trophy, he said in an on-court interview: “It’s easy to talk now. I had to really trust the process and, I’ve said this before, I had to trust in myself. “I owe a great, great thanks to my team, to everyone who has been supporting me in the last couple of years that haven’t been that easy. “I had a surgery, was absent from the tour for six months, and faced for the first time this kind of severe injury. I didn’t really know what was expected, I had many moments of doubt, didn’t know really if I could come back to the level to compete. Djokovic — now a four-time Wimbledon winner — took particular delight from the fact his three-year-old son, Stefan, was present for the trophy presentation. “It feels amazing because for the first time in my life I have somebody screaming ‘daddy, daddy’ and it’s a little boy right there,” he added. Having come through epic encounters with Roger Federer and John Isner to reach the final, Anderson was outclassed by Djokovic early on but rallied impressively and had five set points in the third before losing a tie-break. “I would just like to congratulate Kevin because he deserves it, his team as well,” Djokovic said. “He’s had an incredible run, he’s had quite a few hours in quarter-finals and semi-finals on the court.